There are many ways to get discounted prices on Virginia CLE® publications. Discounts cannot be combined or applied retroactively. Questions? Please do not hesitate to contact us at (800) 979-8253 or vacle@vacle.org. All Virginia CLE® Publications now include FREE SHIPPING! Buy More, Save More! Virginia CLE® has discontinued libraries and combos, as well as our price and volume discounts, in favor of a multi-book discount that provides greater choice and greater savings! Build within one practice area, or many, to fit YOUR practice. Use coupon code: BUYMORE. Click here for information on seminar discounts. Automatic Update Service - Even greater savings for automatic update subscribers! Updates are very important to the continuing usefulness of law books. Thus, Virginia CLE® offers a discounted automatic update service that includes 25% off of the price of the new edition, plus free shipping (now included with all publication orders). Automatic update subscribers will receive a notice with an option to decline before any order is sent, followed by an invoice and right to return. The automatic update service may be canceled at any time. Seminar materials are not updated. We are continually clearing our shelves to make room for newer publications. We now offer select old editions, in addition to seminar materials, at an attractively reduced price. Go to the Clear The Docket Sale page. Each New Virginia Lawyer may purchase one book at 80% off during their first twelve months of Virginia practice (by Virginia Bar license date). This includes lawyers who have entered the Virginia Bar through the Reciprocity program. Follow this link for instructions on using this and other First Year Coupons. A 30% discount is offered off regular retail publication prices to those employed full-time by a state, local, or federal government entity. Follow this link for instructions on using the Government discount. A 50% discount is offered off regular retail publication prices using our Law School Access Pass. All formats are now included, and orders can be made online. Follow this link for instructions on using the Law School Access Pass. A 50% discount is offered off regular retail publication prices to attorneys employed at organizations funded by the Legal Services Corporation of Virginia. Now applies to books and seminar materials in all formats, including download. No application necessary! Follow this link for instructions on using the Legal Aid discount. 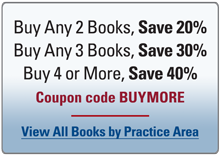 Buy ANY 2 books and save 20%, 3 books and save 30%, 4 or more and save 40%. Applies to all regular-priced books in all formats. Does not apply to seminar materials. There is no limit to the number of books you can purchase, including multiple copies of the same book. When ordering online, use coupon code BUYMORE. A 25% discount is offered off regular retail publication prices to all lawyers in their first three years of Virginia practice. This includes lawyers who have entered the Virginia Bar through the Reciprocity program. Follow this link for instructions on using the New Virginia Lawyer discount. A 15% discount is offered on any book or seminar material purchased on-site at our live seminars and video replays. Download orders cannot be accepted at on-site seminars.